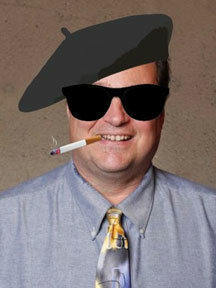 Image by the incomparable Joe G., in honor of my debut as a sophisticated author. Currently most of my story is told on the “Welcome” page of this site, so the best way to see more details about me is to read the official book and author descriptions for my book. Both descriptions appear below, slightly updated and adapted for brevity. Also, for individual or group study, check out the study questions and other free resources, currently located on my Resources page. Please don’t hesitate to contact me if you’d like to dialog, share questions or comments, or discuss speaking engagements. 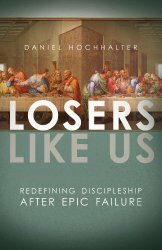 Losers Like Us: Redefining Discipleship After Epic Failure (David C Cook, 2014) skillfully intertwines Dan’s own story with that of Jesus’ twelve disciples to show how our “loser” traits, like theirs, can lead to teachableness, egolessness, brokenness, and empathy—the very qualifications required to receive God’s love and grace, and to manifest his kingdom on earth. Daniel Hochhalter is from Missoula, MT but currently lives with his wife and various wiener dogs in Portland, OR, where his only true credential is that the Lord loves him. Dan has a B.S. from Liberty University and an M.Div. from George Fox Evangelical Seminary. He does not have a PhD.